The book is the first of a new series, The Global Middle East, with the author being one of the two general editors of the series. The series seeks to broaden the horizon of the ‘Middle East’ to range from the Atlantic to the subcontinent, and to include the diaspora originating from these lands living in the West, besides introducing authors and ideas from the region to the Anglophone academy. The author, currently Professor in Global Thought and Comparative Philosophies at the School of Oriental and African Studies, London, is also holding the Chair of Iranian studies at the London Middle East Institute. He sets the bar high for the series by focusing on psycho-nationalism in Iran; with psycho-nationalism loosely defined here as the psychological roots of national identity. Adib-Moghaddam examines the manner in which the Iranian governments earlier under the Shah and latterly under the clerics have utilized psychological dynamics in the making (creating, sustaining and selling) of the Iranian ‘nation’. [ihc-hide-content ihc_mb_type=”show” ihc_mb_who=”reg” ihc_mb_template=”1″ ]While the Shahs reached back into a pre-Islamic past, to the age of Iranian superpowerdom under Darius and Cyrus, to legitimize their rule, post-revolutionary Iran has emphasized its Shiite heritage, which interestingly does not go as far back into the Islamic age as a reader unfamiliar with the details of Iranian and Islamic history might have imagined. The book is thus very timely, since its examination of the Iranian case is instructive for the times we live in, when across the world there has been a lurch to the Right. Arshin begins his book with a synoptic view of the trend towards populism, including in the United States exemplified by the campaign-winning slogan ‘making America great again’. He notes that the case of Iran has escaped closer scrutiny in the study of ‘the way the idea a nation-state is created and sustained’ (p. 3). Arshin sets about the task to ‘understand conceptually how the idea of Iran created, in order to understand the mechanisms and effects of psycho-nationalist discourse’ (p. 4). An upshot of the exercise is that the phenomenon of the nation-state has not come into existence through a process that is distinctly ‘modern’, but, as Arshin demonstrates, there are ‘“nationalized” entities in antiquity’ (p. 9), such as the Sassanid Iran (pp. 224-651) that had its own sense of nationhood comprising, as modern nations do, a religious (Zoroastrian) narrative, symbolic capitol (Ctesiphon), language and a Persian-centric ethno-ideology. It was only the absence of mass communication techniques available in the modern age (the printing press, for instance) that led to difficulties in sustaining the nation. 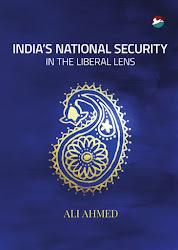 A signal insight from the book is that ‘where there is bio-power, there is also resistance, and where there is psycho-nationalism, there is opposition’ (p. 11). He draws on Michel’s Foucault’s term for mature forms of mind control of people, ‘bio-political’. Through a look at the intrusive ideological education intended to increase penetrability of the population to psychological control, he lays out how the techniques have failed to extend the sovereignty of the state by turning ‘citizens into objects of power’ (p. 11). There continues to be in Iran, as elsewhere, resistance to state-engineered psycho-nationalism. States routinely exploit the ‘grey zone’ between affinities of belonging and hegemonic emotions that underlie national aggression. The latter find an arena in global politics through narcissistic and hubristic self-assertion by the in-group. Internally, psycho-nationalism is ‘division-creating’, averse to complexity and dissent, and but a sophisticated form of ‘divide and rule’. This leads at best to creation of a ‘quasi nation’. Arshin singles out psycho-nationalism for ‘what it does not do: integrate, ameliorate, harmonise, assimilate’ (p. 19). In Iran, clerically-ordered nationalism, and that of the Shah before it, has not subdued the struggle for freedom based on a narrative infused with cosmopolitanism, tolerance, liberal, secular and inclusive values. Arshin’s conclusion bears repeating for its resonance in our part of the world abutting Iran: ‘The real meaning of the country cannot be found in discourse, institutions or national anthems. It is the everyday life of Iranians (or Indians for that matter—added) that is real, it is the trials and tribulations of our daily affairs that give any nation its real meaning and purpose. Everything else is concocted for the nefarious purpose of political power’ (p. 19). 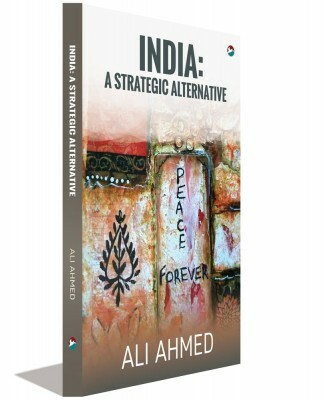 The book can help readers in India better understand not only Iran as any Iran-centric book must, but also incidentally what is happening closer home in the invention of a new India, no longer secular or plural, and (increasingly) not democratic either. Just as in Iran, there is dissent in democratic churnings, for instance, on campuses across the country, as the cultural nationalist narrative attempts to homogenize India into a peculiar image of a Semitic Hinduism. India’s democratic spaces seem better preserved since political power was not in their exclusive hands earlier. However, with the Modi wave and the likelihood of perpetuation of his tenure suggests that the political power that is needed to advance psycho-nationalism is finally with the pseudo-cultural formations over the long haul. This means the Iranian experience can be replicated here and on that count is potentially instructive. If Indians are not enamoured by the siren song of psycho-nationalism, they can be bludgeoned into submission. 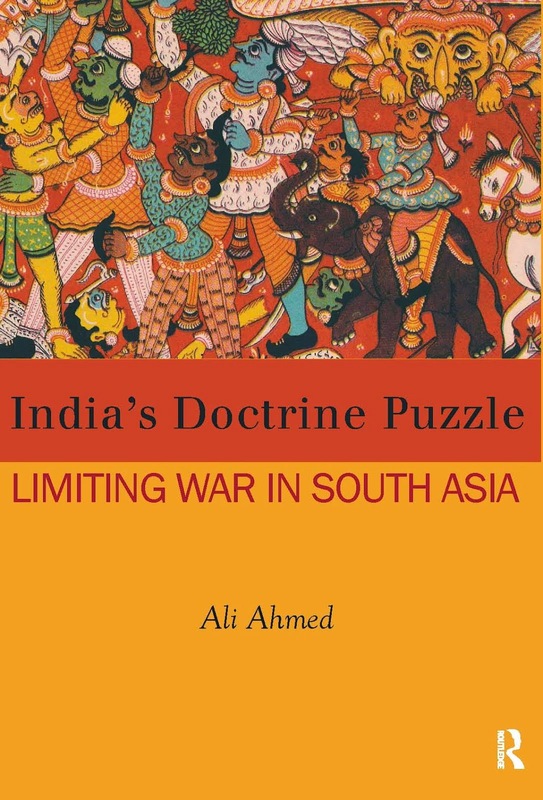 Iran’s external relations showcase how a nation-state is constructed in international politics in terms of aggression towards the ‘other’, which in the case of saffronized India is its twin, Pakistan. 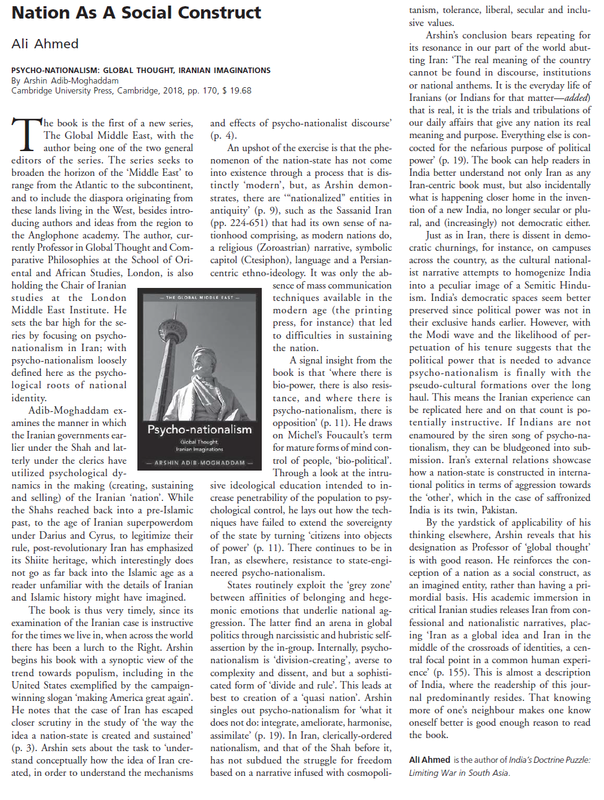 By the yardstick of applicability of his thinking elsewhere, Arshin reveals that his designation as Professor of ‘global thought’ is with good reason. He reinforces the conception of a nation as a social construct, as an imagined entity, rather than having a primordial basis. His academic immersion in critical Iranian studies releases Iran from confessional and nationalistic narratives, placing ‘Iran as a global idea and Iran in the middle of the crossroads of identities, a central focal point in a common human experience’ (p. 155). This is almost a description of India, where the readership of this journal predominantly resides. That knowing more of one’s neighbour makes one know oneself better is good enough reason to read the book.